...Or Just to Have Some Fun! Saturday, April 20: Petty Luv returns to the Foothills Event Center for this benefit concert. There will be food trucks, bike games in the parking lot, and fun for all ages! Tuesday, April 23: Come join us at the Foothills to have a fun time for a good cause painting this endearing composition “There’s No Place Like Home” to help support Sammie’s Friends. Tuesday, April 30: Join us in creating this fun and intuitive watercolor painting in honor of spring, and the explosive bloom we’re experiencing after all that rain! The Foothills Event Center offers elegant gathering spaces, along with a wide array of specialized services and onsite rentals to create a memorable event for your guests. Our experienced staff is eager to work closely with you to ensure your vision is brought to life for the perfect celebration, right down to the fine details. Learn more about how our venue and event planning services can work within your group size and budget by requesting more information here or by calling 530-271-1000. I recently had my wedding reception at the Foothills Event Center and would definitely recommend it! Abby was so great to work with and the venue was beautiful. A great spot for Grass Valley events! Have a question for our coordinators? Get in touch with us! Your Celebration Is Our Pleasure! The Foothills Event Center is a elegant addition to Nevada County’s natural and cultural attractions and our rich gold and mining history. 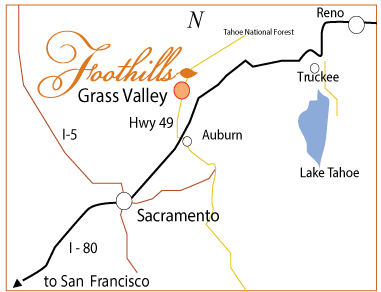 For generations, families have been returning to the foothill communities of Nevada City and Grass Valley, to share and relive the serenity, beautiful skies, and mountain fresh air. Explore our site and call for a tour today: 530-271-1000. We look forward to hosting you! Whether your event is an intimate evening, a business luncheon, or a wedding reception with live music, the Foothills Event Center can easily accommodate your needs. With plenty of on-site parking for 140 cars along with bus parking, blazing fast fiber optic internet, and an open floor plan that accommodates any size group, we are excited to share the Foothills Event Center with you. Discover the charm and historic elegance found in the Sierra Nevada Foothills, a short drive from both Sacramento and Lake Tahoe. We recommend this seating arrangement for wedding celebrations, larger parties, dinners, or cabaret-like theater shows. You have the option to add our movable stage to the setup. This arrangement is ideal for concerts, presentations or memorial services. It allows each guest to see the presenter or overhead projector. The theater setup is perfect for team events or workshops, as participants can easily move their chairs to break up into smaller groups. A stand-up social setup where drinks and appetizers are served. Receptions or networking events can benefit from this flexible format. Food can be offered on a buffet table or passed by waiters. This light setup can be converted into any other arrangement on the spot. This is the most efficient system for classes and presentations where note taking is required. In addition, we offer a movable stage, a presenting platform, as well as an overhead projector. These seating examples are best for small groups of 40 or less. If you’re making a presentation, you can sit at the head of this setup to facilitate easy interaction with your group. We offer paint and sip classes a few times each month, as well as private paint parties. This arrangement has been proven to allow the most interaction with the instructor, while also giving each participant a personal space to paint. The instructor is located on the stage, or another presenting platform depending on the size of the group.